Discounted Cash Flow (DCF) analysis is a generic method for of valuing a project, company, or asset. A DCF forecasts cash flows and discounts them using a cost of capital to estimate their value today (present value). DCF analysis is widely used across industries ranging from law to real-estate and of course investment finance. 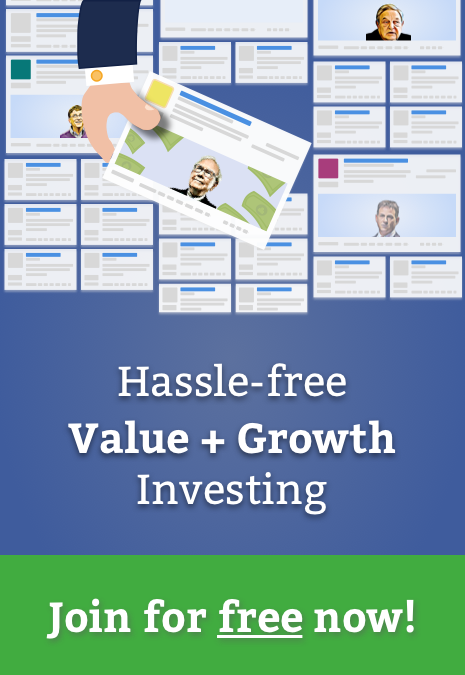 Note: If you've read our guides on DCF: Revenue Exit Method already, you can skip ahead to the Terminal Value section as you may find other sections of this guide repetitive. 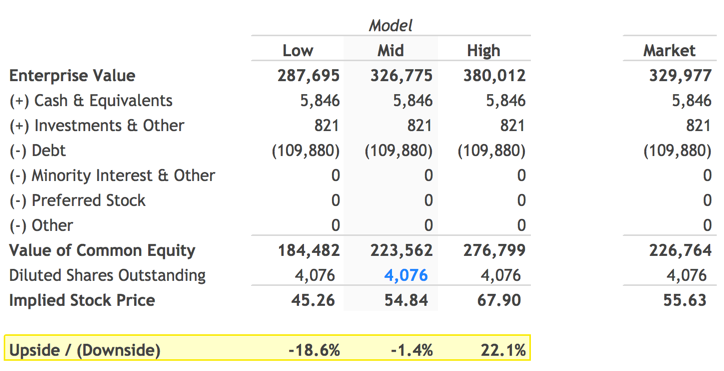 Since we can't keep projecting cash flows forever, most DCF models forecast cash flows individually for five or ten years and then estimate a continuing value or Terminal Value. Terminal value represents the future value of a company beyond the projection period. Depending on the length of the projection period, it is not uncommon for the Terminal Value to represent 75% or more of the company's total value. 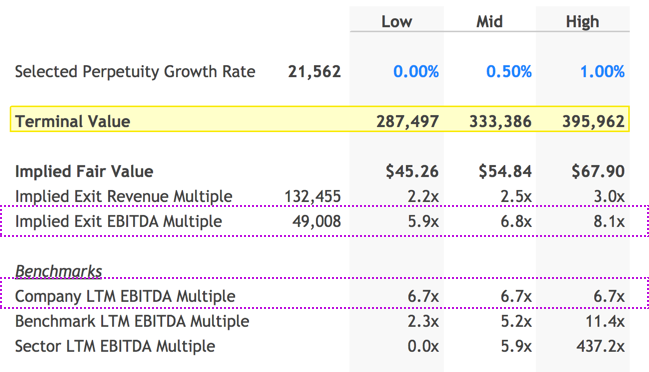 Since Terminal Value is a critical assumption, finbox.io offers three options for estimating the value: Gordon Growth approach, EBITDA Multiple and Revenue Multiple. This guide will walk through a DCF analysis for Verizon that uses a Growth Rate to estimate Terminal Value. The philosophy behind a DCF analysis argues the value of a company is equal to the expected future cash flows of that company. Since future free cash flows can be difficult to estimate directly, the model helps us build up to them. The model starts at the top of the Income Statement by creating a forecast for Revenue and then works it's down to Net Operating Profit After Tax (NOPAT). When available, finbox.io uses analyst forecasts for Revenue as the starting assumptions in a model. To forecast Revenue, analysts gather data about the company, it's customers and the state of the industry. I typically review the analyst forecast and modify the growth rates based on historical performance, news, and other insights I've gathered. How much of the revenue Verizon generates will the company convert into profit? The model uses EBITDA as a proxy for profit at this step and deducts Taxes, Depreciation & Amortization expenses separately later in the model. Depreciation and amortization are usually part of Cost of Goods Sold (COGS) or Selling General & Administrative Expenses (SG&A). Since it's a non-cash expense the model runs the D&A forecast to estimate NOPAT but adds it back in the build-up to free cash flow. Including it in the NOPAT build allows the model to capture tax benefits associated with D&A. To avoid double counting the outlay's associated with capital expenditures, the model deducts the actual capital expenditures forecast and adds back D&A. Over the last five years, Verizon has paid 19.7% of it's GAAP income in taxes. This felt a little low compared to the 39.1% U.S. marginal corporate tax rate so I assumed a 30% tax rate in my model. Next, we need a discount rate to calculate the present value of the forecasted free cash flows. 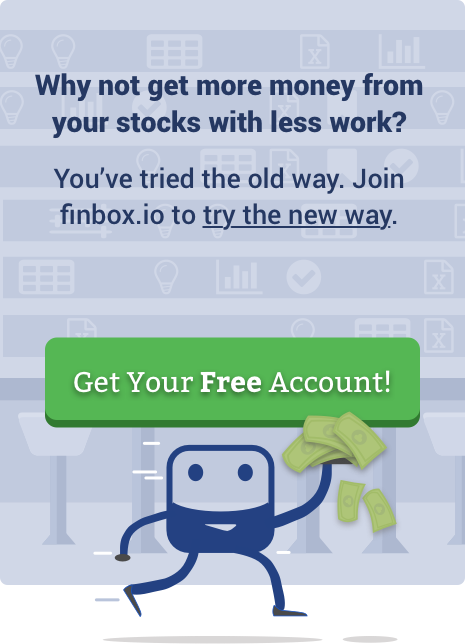 finbox.io has a Cost of Capital that you can use to arrive at your own estimate for Cost of Capital. I determined a reasonable WACC estimate for Verizon to be between 6.5% and 7.5%. The model does the heavily lifting of calculating the Discount Factors using the mid-year convention. You can follow the methodology used to by reviewing the a) Discounting Periods and b) Discounting Factors. Applying the Discounting Factors however is simple. 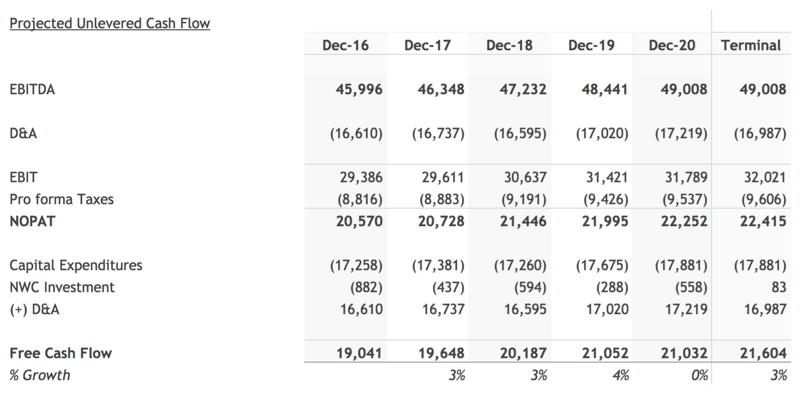 For example, to calculate the present value of December 2020 projected cash flow, we can multiply Verizon cash flow that year, $21,032, by the matching discount factor. As mentioned earlier, this variation of the DCF uses the Gordon Growth method to estimate Terminal Value. inflation rate of 2-3% and the historical GDP growth rate of 4-5%. Comparing the Terminal Value implied by selected Perpetuity Growth Rate multiple to other approaches to estimating Terminal Value can serve as a useful sanity check. 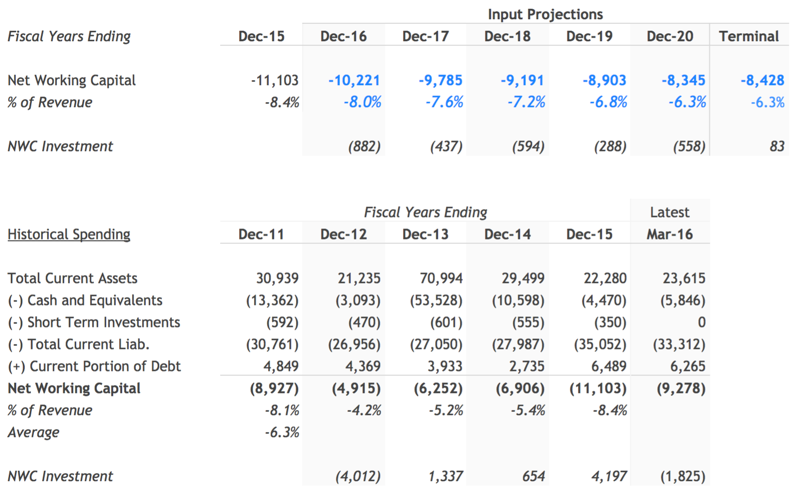 For instance, if I used the same assumptions in a DCF: EBITDA Exit model but selected a 6.8x EBITDA Exit Multiple to calculate Terminal Value, I would arrive at the same Fair Value. 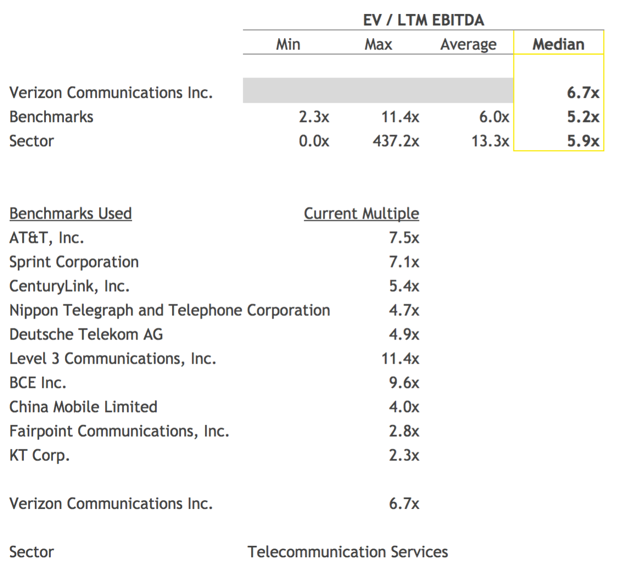 I felt comfortable with my implied exit multiple given Verizon's current trading EV/EBITDA multiple of 6.7x. An Equity Waterfall, aka Equity Value Bridge, refers to the steps used to get from the Enterprise Value of a company to its aggregate Equity Value or Market Cap. The model uses the formula above to calculate Equity Value and divides the result by the Shares Outstanding to compute Fair Value per Share. The assumptions I used in my model implied a range for Fair Value per Share for Verizon of $45.26 * to *$67.90. Verizon's current stock price is $55.63, 1.4% above the mid-point Fair Value of $54.84. Verizon's 52-Week Low however is $38.06. At $38.06, Verizon would be trading at ~31% discount to my ~$55.63 computed Fair Value. Given Verizon's long track-record and low price volatility (Beta of 0.5), it would be a fantastic value at those levels. finbox.io's Price Target and Alerts features are designed to help you monitor for pull-backs in stock price until the entry point suits your investment objectives. The DCF model can seem complex as first but it's worth adding to your investment analysis toolbox since it provides the clearest view on value of a company. Instead of focusing on the getting each of the assumptions exactly right, take Keynes' advice on being roughly right. Select different reasonable assumptions to get a sense for key drivers of value. You can save different scenarios (e.g. Base Case, Downside Case etc.) to get comfortable the upside and downside potential of the company. As with all models on finbox.io, I recommend using a combination of models to get a sense for the risk involved and triangulate a fair value. Investopedia: What is a Discounted Cash Flow (DCF)?